We have compared the best electric fireplaces on the market. All styles are covered in detail so you can keep your home warm in winter. This fireplace insert will heat up rooms up to 400 sq. ft. and emits a BTU level of up to 5000. 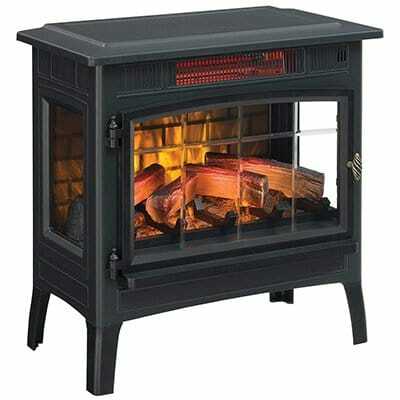 This stove heater will heat up rooms up to 1000 sq. ft. and emits a BTU level of up to 5000. This wall mounted heater will heat up rooms up to 400 sq. ft. and emits a BTU level of up to 5000. Winter time is here again – and that can be a good thing or a bad thing depending on your point of view…right? Regardless of your views on the winter season, with the cold temperatures comes the need to keep your house warm. Sometimes your furnace may need a little help to keep a particular room at the temperature you like…or you have a room that where you would like to add a little atmosphere and ambience. An electric fireplace is just the home accessory you may be looking for! There are many benefits that are associated with having an electric fireplace, with cost and safety being at the top of the list – not to mention that they are much more attractive than that old space heater you’ve had sitting around the house. Cost is certainly one of the biggest factors to consider. According to the U.S. Department of Energy, average energy costs are $2,200 a year with almost half of that going towards heating and cooling. Electric fireplaces are great tools for implementing a smart zone heating strategy to save big on your heating budget. We have compared what we feel are the 12 best electric fireplaces on the market. All styles are covered so you keep your home warm in the winter – and be stylistic while doing it! Before we get to the reviews, let’s take a few minutes to look at the different types that are available and also make note of the major points you should consider when making your buying decision. Freestanding “stove” electric fireplaces (made to replicate the look of a freestanding wood stove) are among the easiest to install – because there really isn’t any installation. With these units you simply select the location in your room where you want it, and then plug it in (no hardwiring is usually required). You can’t get much easier than that! Just because they are easy to install doesn’t mean that they lack features, however. They come in a wide span of heating ranges, and most have some sort of realistic flame effects. As the name implies, these units are meant to mount on your wall much in the way that a picture frame would be. The proper procedures must be followed to ensure a safe and effective installation. They normally come with all of the hardware needed, whether they are light enough to mount right into drywall (using the proper anchors) or require a more robust method (such as going directly into wall studs). Wiring may be more elaborate than just plugging it in; for these reasons the installation might be better left to a professional. Benefits include the unit being out of the way so you have more floor space, and it can be mounted at any height you wish. These units are similar to wood burning inserts in that they are designed to install in the fireplace that you already have. Installation is typically much easier than that of a wall mounted unit as they normally sit right in the firebox, and they are plugged directly into a standard 120V wall outlet. While all of the different types add style to your room, an insert gives you the most “traditional” ambience of a warm fire in the fireplace. Mantel units are similar to freestanding units as far as installation ease goes, but they can be a bit fancier from a visual standpoint. These are the units that are meant to sit directly against a wall, and they have a mantel on the top of the firebox that can be decorated to your taste – a great place to put all of those family pictures in addition to adding decorations for the holidays! These are plug-and-play as well in that there is no extensive wiring required. These larger units are combine the benefits and features of a mantel-style electric fireplace with the ability to set a TV on top. They tend to be larger – more long the size of a nice, quality entertainment center. Many have compartments to hold various AV components as well. These are great for smaller rooms where there just isn’t enough space to have bot an entertainment center AND a fireplace. The type of unit that you may want is only one part of the equation as to which unit would be the best for you. Looking stylish is one thing, but there are many items related to how well the unit will operate that are just as important. When considering the size of the room, you have to look beyond just whether the unit will have enough capacity to heat efficiently (we’ll discuss more on that later). Here I’m referring to the actual design of the room, taking into account everything else that you already have in it. That larger TV stand fireplace that you are looking at may be really nice, but how will it look if your room is on the smaller side? The same can be said for the other side of the coin – make sure that the unit you are considering isn’t so small that it will look awkward and out of place. The conditions of the room where you plan on installing your electric fireplace need to be ideal for efficient operation. A room that is poorly insulated will not retain heat very well, so the unit will have to work harder in order to keep the temperature at a comfortable level. Ceiling height is a factor that is often overlooked. Normal rooms with a ceiling height of 9’ to 10’ are the most ideal. Remember that heat rises in the atmosphere, and that isn’t any different within your home. Heat will rise to the top of a room, and if the ceiling is too high then all of your warmth will simply go up to the top where you won’t get any benefit from it. I wouldn’t even consider placing any type of electric fireplace in a room where there are cathedral ceilings. Ceiling fans can be used to help circulate the warmer air towards the floor, but they should be set at a slow setting as to not cool the air down, and the air circulation works the best if the fan rotation is set to run in a clockwise direction. This will pull the colder air up and force the warmer air at the top of the room down the walls (to avoid being able to actually feel the air moving). Flooring is important as well. While most units are safe to place on carpet, the flooring still needs to be level for safe operation. Space considerations need to be made as well. If you take a larger unit and place it diagonally in the corner, then more valuable floor space will be taken up. Also, make sure that – in the case that there already are heating ducts in the floor (or baseboards) that the fireplace doesn’t cover them up; that pretty much kills the whole idea of having it as a supplemental zone heating source. One of the biggest benefits of an electric fireplace over a traditional wood or gas fireplace is the high level of efficiency. Wood fires in particular are known for not being very efficient. A wood burning fireplace actually loses a large percentage of its’ heat (around 90%) up the flue of the chimney. Gas units tend to be better, but still not at the level of an electric fireplace. As with the wood fire, a gas unit has to be vented to the outside atmosphere to avoid dangerous gases that are byproducts of combustion (such as carbon dioxide) from being exhausted in the room itself. Electric units use a heating element where the majority of the energy put into it is transformed into heat and then distributed by a blower unit. As far as heating an entire home electricity may not be the best option. For a more localized application like helping to heat a single room (i.e., “zone heating”), an electric fireplace is much cheaper – and safer – than wood or gas. If you want to get warm, then you might as well look good while you’re doing it! Manufacturers take care to design units that are more aesthetically pleasing than a simple space heater. A large majority have special effects to simulate the look of an actual wood fire, with some even having sounds built in to sound like logs crackling. The realism of these units is one thing, but the creative design for them is very impressive as well. Regular fireplaces can be things of beauty that really help to add ambience to a room. The electric units can range from simple (such as those that simulate a basic wood burning stove) to very elaborate ones that look like very expensive and ornate wood burning fireplaces. As with any appliance that can potentially generate a large amount of heat, it is very important to select an electric fireplace that has a good number of safety features built in. Look for units that have some sort of automatic shut off so that, if left on too long, they will turn off on their own. Some also have special switches in them where they will shut off if they tip over. Another important safety factor to consider is overheating. The heating elements used in even the best electric fireplaces can draw a good amount of current, and that can lead to issues with the plug and wiring coming from the wall outlet. Some models may have a feature within the plug itself where the unit will automatically shut off if it gets too hot to be safely operated. OK…time for a little physics lesson here (yeah…I hated physics in school too…but this is kind of important so you’ll have to bear with me for a bit). The capacity of a heating source (whether electric, gas, or wood) is measured in what are called BTU’s (British Thermal Units). A BTU is the amount of heat needed to take the temperature of a pound of water and raise it one degree (Fahrenheit). Realistically the amount of heat that can be generated by an electric fireplace would be similar to that of many space heaters. You shouldn’t expect to completely heat a large area; however, they are excellent options for zone heating to supplement your main heating source for the home. These two factors aren’t necessarily unique to electric fireplace shopping. Prices will range from relatively inexpensive to potentially costly (based on the design, visual appeal, and available benefits and features. Really, though, you need to pay attention to the price. I think it’s a fair statement to say that some of the more economical units may not have the attention to quality that you want to have. As I always say – more often than not you get what you pay for (caveat emptor)! Piggybacking on the price, having a good manufacturer’s warranty is one of the best benefits that a unit may have. Is it lifetime? Warranties may be lifetime but can be limited to certain factors. Shorter warranties may not be to your benefit if you plan on keeping the unit for the long-term. Our #1 pick for the best standalone electric fireplace is the Duraflame Electric Infrared Quartz Fireplace with 3D Flame Effect. 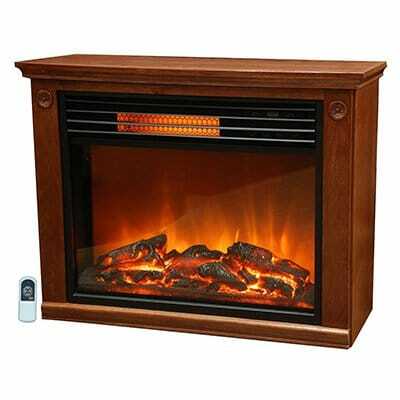 Designed to look like a real wood stove (with study metal and glass construction), it has a patent pending 3D flame effect to add just the right amount of ambience to your room with up to five different settings for the flame brightness. The effect can also be ran without the heating function as well. 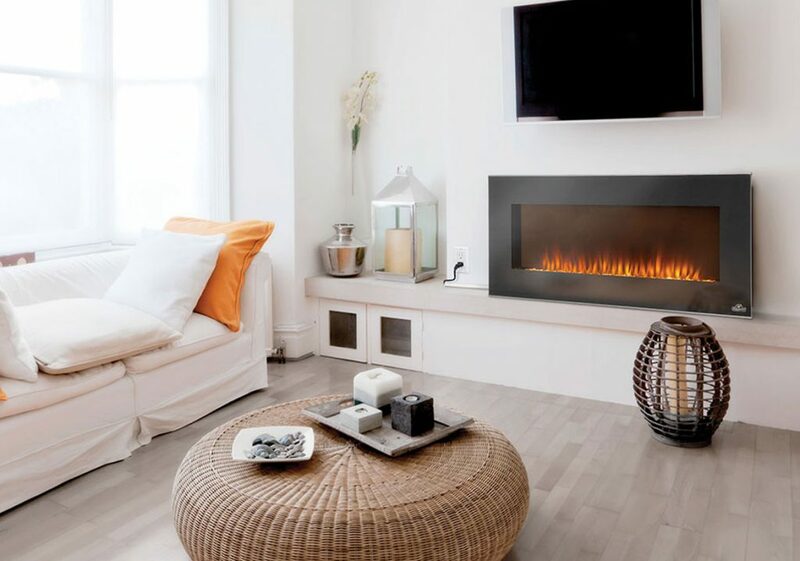 It uses a quartz infrared heating element that adds extra comfort by not affecting the humidity in the room, and it actually can heat a larger area than a typical 1500W fireplace. A big benefit is the SaferPlug™ fire prevention technology. This unique feature actually monitors the temperature of the electric plug while in operation, and will automatically shut the unit down to avoid overheating and danger of a fire. The digital thermostat accurately controls the heating level, and the 3-year limited manufacturer’s warranty gives you peace of mind. 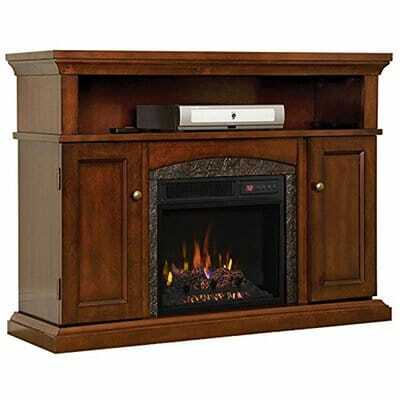 Our choice for the best electric fireplace TV stand is the ChimneyFree Lynwood Electric Fireplace Entertainment Center. This impressive unit heats up to 1,000 sq. ft. while looking great doing it! 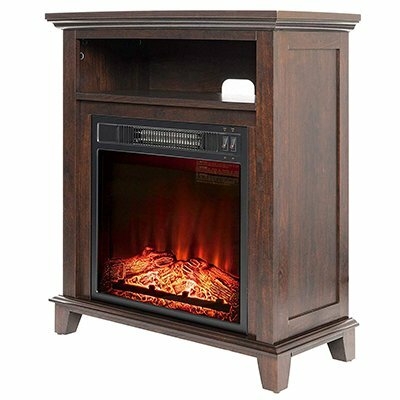 With an 18” firebox insert that has multiple flame colors and brightness levels (provided by the SpectraFire flame effect technology) and a rich wood finish, this unit will enhance the atmosphere of any room. Its’ larger size and rugged construction will accommodate a flat screen TV without any concern for it being affected by the heat generated from the unit itself. Additionally, it has several storage compartments for your DVD and game media plus room for the DVD player and/or game system as well. Installation is a snap with the unit being operated by a standard 120V wall outlet, and a four-button remote control makes temperature control (and on/off operation) a breeze as well. Packed with features you won’t normally find, the award for the best electric fireplace with a mantel belongs to the MagikFlame Electric Fireplace and Mantel. The flame effects on this unit are a step above the rest, with 26 different effects that are video-based utilizing our HoloFlame technology. You can even simulate smoke effects of a wood fire (including the log crackling sounds), or the bluish color of a gas flame! Remote control? Who needs that when you have an iPhone or an iPad that has the MagikFlame app installed? The heating element will heat up to 1,000 sq. ft. for maximum heating comfort, and the luxurious wood finish and top-notch visual design will certainly make this unit the high point of your living room, bedroom, or family room. Assembly and installation is quick and easy with the easy-to-follow instructions, and all you have to do (once assembled) is plug it into any standard 120V wall outlet. While we call the GMHome 40” Electric Fireplace the best wall mounted unit on the market, it can be configured to be a great freestanding unit as well! Realistic flame effects can be configured with nine different colors of LED’s (even green and blue) and five different brightness settings, giving you unique options to add style to your room that many other units do not have. This 1500 watt unit can heat up to 400 sq. ft. and is operated with a handy remote control in addition to manual operation. Features controlled by the remote include the flame effects, temperature control, and also a timer. You can be assured to feel safe with this unit thanks to the integrated safety cut-off protection that will guard against overheating. Installation for both the wall-mounted and freestanding options are super easy, and with a standard 120V outlet operation there is no concern about wiring regardless of the configuration – just plug it in! If you already have an existing fireplace that you may not be using, then the PuraFlame 30” Western Electric Fireplace Insert is for you. Designed to easily fit within an existing firebox, it has many great features that makes it a great alternative to an actual wood fire. Experience a realistic wood fire with life-like resin logs with a simulated ember bed in addition to LED flame effect with three configurations and brightness levels. It can run in either a 750 watt or 1500 mode to give two distinct temperature ranges (using a standard 120V wall outlet), and it can effectively heat a 400 sq. ft. room. On and off operations can be managed with a convenient remote control as well. Safety features include protection against overheating, and a 1 year limited manufacturer’s warranty will protect against any defects in operation, materials, or workmanship. For those fireplaces that have a larger opening, the R.W. 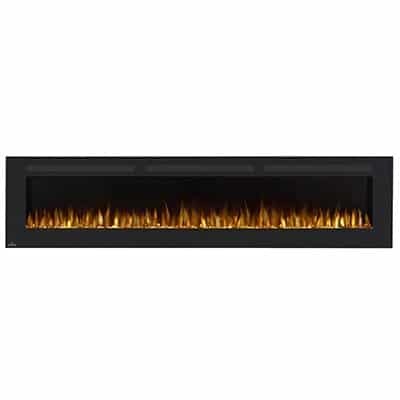 Flame 36” Electric Fireplace – Insert is our choice for the best electric fireplace insert (above 30”). A convenient touch pad on the front panel lets you control not only the heating range but also five distinct LED flame effect settings and five separate settings for colors on the “burning” logs. A unique “automatic” feature will scroll and change colors automatically to enhance the visual appeal of the unit. The remote control has the ability to control all of the unit’s functions and features (not just on/off) including a timer, speed of the flame effects, and a sleep mode to take the lighting level down while still generating enough warmth to heat up to a 400 sq. ft. space. The unit comes in several size options in order to fit your existing firebox in the best way possible, and the integrated overheating protection and 1 year limited warranty will give you worry free operation. If you’re in the market for a compact unit that has many of the features more expensive units possess, then the AKDY 27” Electric Fireplace Freestanding Wooden Mantel Firebox is one of the best small electric fireplace heaters we have come across. Small on size but not on power, this unit will heat a 400 sq. ft. area just as well as units on the higher end of the price range while being able to fit just about anywhere in your room. You can be stylish without breaking the bank with a red LED based flame effect that can be operated independent of the heating functions. A safety shut-off feature, 1 year limited parts warranty, and an attractive wooden mantel design makes the AKDY 27” Electric Fireplace Freestanding Wooden Mantel Firebox a great option for those working within a smaller budget. 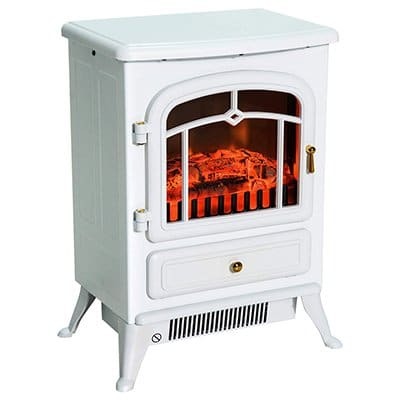 Compact and attractive, the HomCom 16” 1500W Compact Freestanding Electric Wood Stove is the perfect solution for adding supplemental zone heating to your living space. This unit has all of the benefits of a real fire without all of the mess and upkeep. The realistic log flame effect combined with enough heating power to warm over 300 sq. ft. will almost make you forget it’s not a real wood stove! The wattage setting has two settings (750W and 1500W) with an adjustable thermostat control to provide maximum comfort, and the stylish metal finish (choose from three different options) with copper accents adds a touch of class to any room. You can be assured of safe operation thanks to a set of safety switches that will shut off the unit in case of thermal overload or in case it tips over. Your heating budget will love you as well as this is one of the best energy efficient electric fireplace heaters on the market. 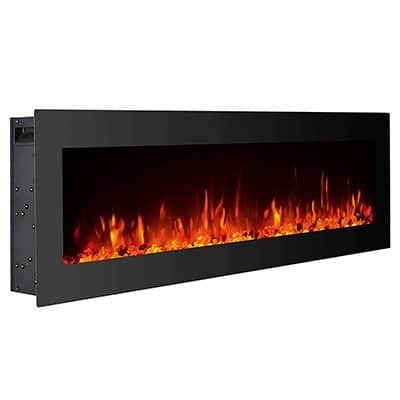 The Lifesmart Large Room Infrared Quartz Fireplace is our pick for the best electric fireplace under $200. Why pay more when you can enjoy just about all of the same features for almost half the price of comparable units on the market? A big feature is the use of quartz infrared heating elements which provide quality heat that will not affect the atmosphere of your room, keeping it nice and comfortable. Realistic flame effects that can be used with the heating function disabled makes this a great unit to add flair to any room, and the convenient remote control lets you adjust heat settings along with turning the unit on/off and setting a timer that will go for up to 12 hours. A digital display makes exact temperature adjustments a breeze. Safety is a main concern with this unit. Most electric fireplaces come with overheating and tip-over shut off switches, but the Lifesmart Large Room Infrared Quartz Fireplace also has a unique child lock feature that will disable both the remote control and also the controls from the main panel. Most electric units are rectangular and do not lend themselves well to installation in the corner of your room. 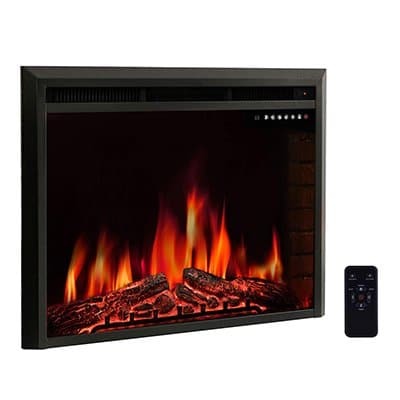 We’ve found that the best corner electric fireplace is the Southern Enterprises AZ6139IF Corner Media Infrared Fireplace as it nests right in your room’s corner without any wasted space. 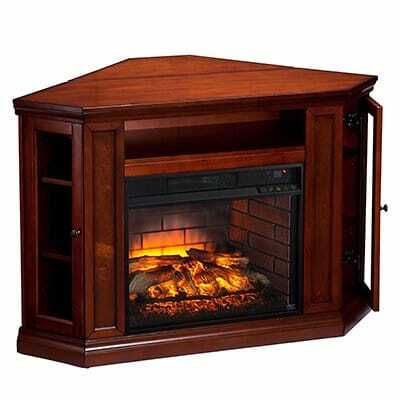 With a luxurious wood finish and rugged construction, this unit is built to last for years. 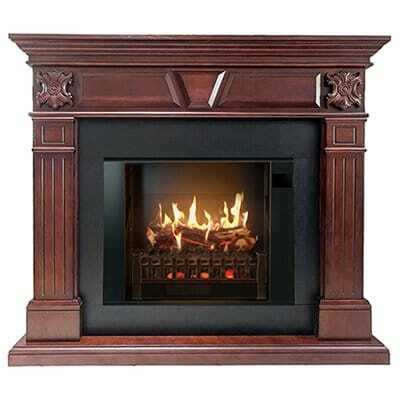 The mantel can support up to 85 pounds and it also has enough space on top to easily accommodate a 46” flat screen TV. Enjoy a smooth, comfortable heat with a quartz infrared heating element system that has an energy efficient fan to heat up to 1,000 sq. ft. The LED flame effects have five different settings and can be used without the heating elements active to help add ambience to your living or family room. 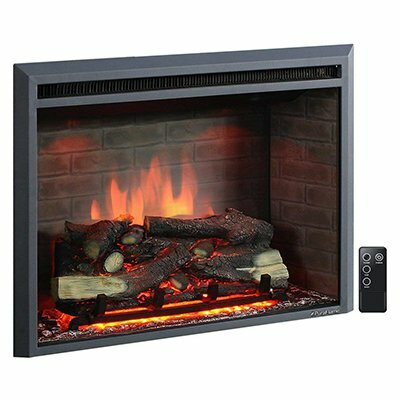 The Southern Enterprises AZ6139IF Corner Media Infrared Fireplace keeps your safety in mind as well with automatic overheating protection, a child lock feature, and a cool-to-the-touch front glass panel. The Real Flame 8060E Harlan Grand Electric Fireplace is a great option for rooms where you have enough wall space to install a larger unit. Style meets functionality with this unit. VividFlame LED technology gives a wide range of adjustability, and the programmable thermostat along with timer functions can be managed with the convenient remote control. A 1500W heating element will cost effectively add enough heat to keep your room comfortable, and the sturdy construction and attractive black (or white) finish brings a touch of elegance as well. A 60” flat screen will fit on top of the mantel with no problems! 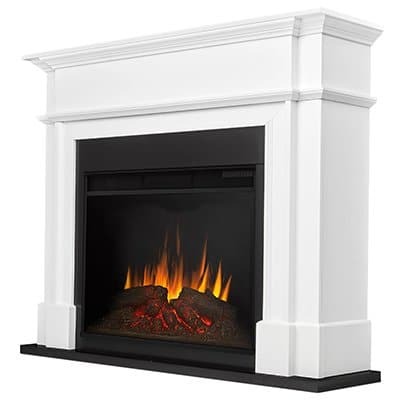 Last (but most certainly not least), we have our top choice for the best large fireplace insert with the Napoleon 100” Allure Linear Wall Mount Electric Fireplace. Yes – it really is 100” long – that’s over 8 feet long! You are certain to make a statement on your home decor with a unit that will have that much visual impact. However, the manufacture does realize that not everyone will have that much wall space, so you can really get this unit in a wide range of sizes from 32” all the way up to the incredible 100” masterpiece! Looking past the sheer size, this unit is filled with great features such as on-screen controls that dim (and eventually disappear) in order to not distract from the visual appeal, enough capacity to heat a 400 sq. ft. room, LED-generated flame and ember bed effects, and a remote control. You also have flexibility with the installation as well. The unit can be simply hung on the wall and plugged into a standard wall outlet or, for a sleek and modern look, recessed into the wall and hardwired. You need to have realistic expectations from any electric fireplace as they are essentially elaborate space heaters. The range is heating capacity among most electric fireplaces is relatively small. For the most part, electric fireplaces come in either 750 watt or 1500 watt power ranges (resulting in 2,500 to 5,000 BTU). A good rule of thumb is that at 5,000 BTU you can effectively heat a 400 to 500 square foot room. To effectively heat a larger area using just an electrical means then that may result in having to use more than one unit (maybe another space heater) within the same room. Do not leave unattended for extended periods of time; accidents can certainly happen without warning. Electric fireplaces are the most efficient units that can be used for a space-heating application. The cooler air in a room is forced over an electric heating element and blown out by the use of a blower fan. Are electric heaters environmentally friendly? Absolutely – much more so than a traditional wood or gas heating source. With an electric fireplace there is no need to vent any dangerous exhaust fumes out into the open outside atmosphere. Do you need an electrician to install these heaters? It all really depends on the type of unit that you buy. Freestanding, mantel, and TV stand units normally can be plugged directly into a standard 120V wall outlet. Wall mounted units can be a bit more involved. Since the wiring is normally hidden inside the wall plugging it in isn’t really an option. In those cases we recommend contacting a trained professional. If you consider yourself to be pretty handy with a set of hand tools then the actual installation of a wall mounted unit isn’t really all that hard to do. All of the hardware (screws, bolts, wall anchors, etc.) are normally included, and some may even have paper templates to place on the wall where you can mark the locations to drill the required holes. As noted in the answer to the previous question, the electrical installation should be left to a licensed electrician. Is it safe to leave them on overnight or when not at home? While it may seem to be a safe alternative, you never really want to leave any sort of heating appliance unattended for any extended period of time. Any heat source that is hot enough to heat a room can most certainly start a fire. What is the expected cost to my energy bill? A typical 1500W unit can cost an average of $0.10 per hour, making it a very attractive option to supplement your central heating source. In fact, some home owners use what is called a “zone heating” strategy where the overall heat level in the home is set to a lower level, then the rooms that are most commonly used have supplemental (and less expensive to run) heating sources such as – you guessed it – an electric fireplace! Can I put a TV safely on these electric heaters? Of course you can – but you have to make sure you are using the right style unit for the application. Aside from weight and size factors, there may be internal insulation with the TV-style units that will protect the TV from the (sometimes) intense heat that can be generated. Keeping all of our points and guidelines will help make your purchasing decision easy – especially with all of the options that are available. Our #1 pick for the best all-around electric fireplace (Duraflame Electric Infrared Quartz Fireplace with 3D Flame Effect) contains the benefits and features we had discussed. Electric fireplaces are a way to cost effectively supplement the heat in your home while adding a contemporary flair to the room. So, this winter, use our guide to keep warm, show some style, and save money while you are doing it!